5ms wide and weighs 4.4 grams - makers mark "BMS" . ================== This ring is ROSE gold ==============. Fully hallmarked Birmingham 1900. Rose gold wedding ring/band 9 carat gold. Most of the wedding rings have been polished and cleaned to a high standard. Width in mm of the band 5. Weight 2.9 grams. 5 mms wide and weighs 2.5 grams - in very good condition with makers mark "H.A" for Charles Henry Ashton . ================== This ring is ROSE gold ==============. 5ms wide and weighs 2.7grams - makers mark "AS" for Albert Sydenham . ================== This ring is ROSE gold ==============. 7mms wide and weighs 6.8 grams - has makers mark "SH" for Samuel Hope . ================== This ring is ROSE gold ==============. 9ct Rose Gold Patterned Wedding Band Ring. Patterned Design Around Band. CIRCUMFERENCE (mm). 9 Carat Rose Gold. Band Width: 4.2mm. Any white gold has been re-rhodium plated where applicable. APPROX US SIZE. 6mms wide and weighs 3.5 grams - has makers mark "SH" for Samuel Hope . ================== This ring is ROSE gold ==============. 6 mms wide and weighs 3.2 grams - in good condition with makers mark for Samuel Hope. ================ This ring is ROSE gold ==============. Will be supplied in a ring box but not the one in photograph. Beautiful 9ct rose gold victorian wedding band with Birmingham 1898 hallmark and makers mark "SH" for Samuel Hope - approx. Will be supplied in a ring box but not the one in photograph. 6mms wide and weighs 4.4 grams - has makers mark "KBSP" . ================== This ring is ROSE gold ==============. Makers mark "H & M". Attractive victorian 9ct rose gold ring or wedding band stamped with Birmingham hallmark for 1898 in very good condition - weighs 2.2 grams and is between size "J" & "K" or US size 5 - width size is 5mms. Fully hallmarked for 9ct gold, assayed in Chester in 1934. Size: US 6 1/4, UK M.
We have a lovely collection of jewelry to list, all in wonderful condition. Ive taken pretty good photos, I think. This one is fully hallmarked for London 1975 with makers marks for M S & S in Yellow gold with a beautiful engraved pattern and weighs 1.78 grams, and is in ring size M.
Hallmark for 1920 in ROSE gold. We have a lovely collection of jewelry to list, all in wonderful condition. Ive taken pretty good photos, I think. This one is fully hallmarked for London 1967 with makers marks for S & W in Yellow gold with a beautiful engraved pattern and weighs 2.99 grams, and is in ring size M.
Will be supplied in a ring box but not the one in photograph. 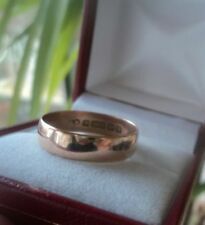 Nice antique 9ct rose gold wedding band. Nice clear hallmarks for Glasgow 1919. Ring weighs 3 grams. Band width is 5.9 mm. Ring is a UK size M.
3.0 grams - in very good condition and with utility mark. These 9ct gold wedding bands weighing around 2.0 grams were often the only choice for British Brides during the period of rationing during and after World War II. These 9ct gold wedding bands weighing around 2.0 grams were often the only choice for British Brides during the period of rationing during and after World War II. 4 mms wide and weighs 6.1 grams - in very good condition . ================== This ring is YELLOW & ROSE gold ==============. 12mmsat widest and weighs 2.6 grams - has makers mark "HG&S" for Henry Griffith & Son . ================== This ring is ROSE gold ==============. Will be supplied in a ring box but not the one in photograph. 5 mms wide and weighs 2.6 grams. ================ This ring is ROSE gold ==============. 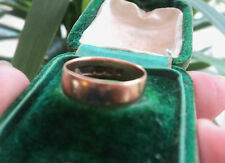 Nice antique 9ct rose gold wedding band. Nice clear hallmarks for Glasgow 1915. Ring weighs 3 grams. Band width is 6.4 mm. Ring is a UK size M.
8 mms wide weighing approx 4.6 grams - stamped with 9ct hallmark for 1901 Birmingham and makers mark "B.B" for Barker Brothers . Will be supplied in a ring box but not the one in photograph. 2.0 grams - in very good condition and with utility mark. The photo is an example of the utility mark. These 9ct gold wedding bands weighing around 2.0 grams were often the only choice for British Brides during the period of rationing during and after World War II. 5 mms wide and weighs 2.2 grams . ================== This ring is ROSE gold ==============. Total Diamond Carat Weight: Approx. 0.16 Carats (0.11 carat centre stone). Gift or Ring Box. The Heart of Hatton Garden. There are a few that are not hallmarked, however they are sure to be tested. £6.50 for. 5 mms wide and weighs 3.0 grams - in good condition . ================== This ring is YELLOW & ROSE gold ==============. 5 mms wide and weighs 2.2 grams - in good condition with makers mark for W.Wilkinson Ltd although polished . ================ This ring is ROSE gold ==============. 4mms wide and weighs 3.7 grams - has makers mark "RMS" . ================== This ring is ROSE gold ==============.